Our good friends Lance and Tina gave us some really big juicy tomatoes from their backyard, so I turned those tomatoes into marinara sauce because we use marinara sauce a lot when we prepare pasta dishes. The cooking process is not complicated, but just long so the liquid evaporates and the sauce thickens. For me it took me about 1.5 hours to cook the sauce, not too bad because I didn’t have to stay and stir the sauce constantly. 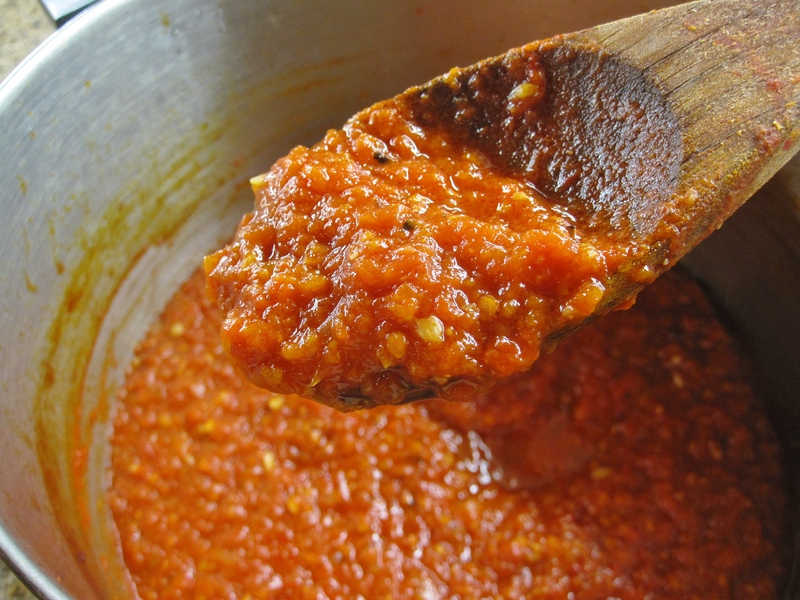 I was busy preparing other food ingredients for lunch/dinner, and the next thing I knew the sauce was about done! Prepare tomatoes: remove the stem part, make a cross cut at the bottom. Blanch tomatoes in boiling water for a minute or until the skin starts to peel off. Drain tomatoes and remove the skins. Put in a food processor and pulse chop tomatoes. Save the juice. Heat a deep pot on high heat and drizzle some extra virgin olive oil. Saute garlic and onion until aromatic. Stir in red chili flakes, tomatoes and juice. Cook on high heat for several minutes. Turn down to medium, and continue cooking until about 1/3 of the sauce left. Stir the sauce occasionally. Add salt to taste. When the sauce cools completely, it can be bagged into batches and kept frozen until ready to use.